Das Spiel ist noch original verschweißt. Friendly service. COSA FARE DOPO AVER ACQUISTATO CORRIERE ESPRESSO. Platform : Playstation 4. Playstation 4. Voice : English. Region Code. Release Year. Does not apply. No DLC or Season Pass codes are included. Disc only. No manual, case, DLC's or inlays. You will receive the exact item in the photo. ,(bei Datenübermittlung für den Paketschein ensteht dadurch ein mögliche falsche Leitcodierung. Die Abholung unsrere Pakete erfolgt durch den DHL Fahrer zwischen 13.30 -15 Uhr. 9:30-16 Uhr). Fünf Arten zu spielen:Need for Speed ist zurück mit fünf Spielmöglichkeiten – Speed, Style, Schrauber, Crew und Outlaw. Format - Sony PlayStation 4. Version - UK PAL. Condition - New & Sealed. Sie fahren schnelle Wagen, gebaut für Highspeed-Rennen und spektakuläre Verfolgungsjagden. Setz Deine Speed Points aufs Spiel, um noch bessere Belohnungen zu erhalten. Wechsle jederzeit zwischen den Rollen hin und her. Die ausgedehnte Open-World-Umgebung bietet in etwa doppelt so viele befahrbare Straßen wie Need for Speed Rivals. Fünf Ikonen aus der realen Welt nennen diese Stadt ihre Heimat. Need FOR SPEED PS4 PROMO GIOCO RARO per Sony PlayStation 4. Riskante Rivalität - Racer sind Einzelkämpfer, auf der Suche nach Ruhm. Sie fahren schnelle Wagen, gebaut für Highspeed-Rennen und spektakuläre Verfolgungsjagden. Volles Risiko - Setz deine Speed Points aufs Spiel um noch bessere Belohnungen zu erhalten. WAS SIE NOCH ÜBER DAS SPIEL WISSEN SOLLTEN Von Schrottkarren zu Supersportwagen. LASS DICH VON NICHTS AUFHALTEN. 100% voll funktionsfähig. Einmalig nutzbare Codes bzw. Bonusinhalte können wir leider nicht gewährleisten. Leider ist es technisch nicht möglich diese Codes vorerst zu überprüfen. WICHTIG: Nur der Empfänger darf sich persönlich Ausweisen. Need For Speed: Rivals. - Spielbar auf:Playstation 4. 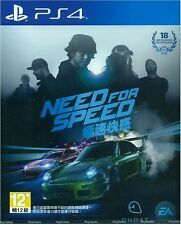 Need for Speed for Sony Playstation 4. I will do everything I can to sort it out. In this corrupt gambler’s paradise, the stakes are high and The House always wins. Play a variety of challenges and events as Tyler, the Racer; Mac, the Showman; and Jess, the Wheelman. Each driver must take on races, missions, and challenges to earn the respect of the Valley’s underground and compete in the ultimate race to finally take down The House. In this corrupt gambler's paradise, the stakes are high and The House always wins. Your leader board will populate with other players of similar skill level so you can see how you rank around the world. PLAYSTATION 4 / USED / PAL. NEED FOR SPEED. THE ITEM PICTURED IS THE EXACT ITEM YOU WILL RECEIVE. Very good. Slight surface marks, nothing major 8.5/10. Discover the nocturnal open world of urban car culture, driven by Five Ways to Play, in this thrilling reboot of Need for Speed. Carve your own unique path, via multiple overlapping stories, gaining reputation on your journey to become the ultimate icon. Need for Speed delivers on what fans have been requesting and what the franchise stands for – deep customisation, an authentic open world filled with real world car culture, and a narrative that drives your game. Ventura Bay is your urban playground - from sweeping hillside roads overlooking the city, to the police infested urban districts with tight city corners - the city comes alive while others sleep. Home to five real world automotive icons, the heroes of today's car culture, they will inspire you, push you, and test you. Buil. Discover the nocturnal open world of urban culture car culture, driven by 5 unique ways to play and win, in this thrilling reboot of Need for Speed. West Coast Urban Setting: Discover a nocturnal open world of urban car culture you never knew existed. 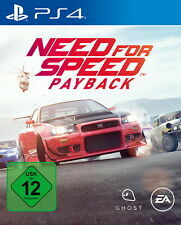 Need for Speed™, one of the world’s bestselling video game franchises, returns with a vengeance in the new action-driving blockbuster Need for Speed Payback. Set in the underworld of Fortune Valley, you and your crew are reunited by a search for vengeance against The House, a nefarious cartel that rules the city’s casinos, criminals, and cops. In this corrupt gambler’s paradise, the stakes are high and The House always wins. Play a variety of challenges and events as Tyler, the Racer; Mac, the Showman; and Jess, the Wheelman. Each driver must take on races, missions, and challenges to earn the respect of the Valley’s underground and compete in the ultimate race to finally take down The House. Your car is at the centre of everything you do. Craft unique rides with deeper. 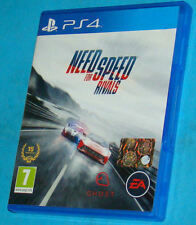 Need for Speed The Rivals on PlayStation 4 Features No matter the side you choose, use technology to keep you one step ahead of your rivals. Seamlessly join a world where your friends are already racing and chasing. Need For Speed: Rivals Discover the nocturnal open world of urban car culture, driven by Five Ways to Play, in this thrilling reboot of Need for Speed. Carve your own unique path, via multiple overlapping stories, gaining reputation on your journey to become the ultimate icon. Need for Speed delivers on what fans have been requesting and what the franchise stands for – deep customisation, an authentic open world filled with real world car culture, and a narrative that drives your game. Ventura Bay is your urban playground - from sweeping hillside roads overlooking the city, to the police infested urban districts with tight city corners - the city comes alive while others sleep. Home to five real world automotive icons, the heroes of today's car culture, they will inspire you, pus. Set in the fictional city of Ventura Bay, the action lets players build a reputation by outrunning police, drifting around corners, upgrading and customizing vehicles, and joining friends for races. Platform Sony PlayStation 4.